In a television series, this would be the beginning of the episode where we bring you up to speed on early character development moments you may have missed. If you’ve tuned into the Content Marketing Institute for any length of time, you are no doubt familiar with the importance we place on the idea of developing a documented, strategic plan. Each year in our research, we find that a cohesive, documented strategy is one thing that separates successful vs. unsuccessful content marketers. In the 2018 B2B research, 62% of the most successful content marketers have a documented strategy vs. 16% of the least successful. One thing we’ve had to repeatedly clarify is that content marketing doesn’t simply replace your broader integrated marketing strategy. Many of the “content-marketing-is-dead” articles make the false assertion that we proposed businesses stop classic advertising, PR, cold calling, and all other forms of classic marketing in lieu of content marketing. Content marketing is, and has always been, best served as an integrated infusion into a broader marketing strategy – a multiplier. Content marketing is the opportunity to make everything we do better. For many businesses, content marketing is but a small fraction of their overall integrated marketing, perhaps helping one aspect of a broader strategy. For other companies, it may be the vast majority of what they do. Your balance is uniquely yours as part of your strategy. But, interestingly, I’ve started to see an increasingly larger opportunity for content marketers to play a true leadership role in that broader marketing strategy. Content marketing strategy can be the foundation for a nonexistent integrated digital marketing strategy. In 2017, I traveled more than 185,000 miles working with enterprises to operationalize nascent (or broken) content marketing strategies. In most cases, I noticed the one thing paralyzing their content marketing strategy was the lack of clarity for the broader digital – or integrated – marketing strategy. 96% of the companies (all but one) said they were siloed and had an increasingly difficult time aligning their enterprise digital marketing efforts across products, channels, regions, or even functional areas (brand vs. PR vs. demand generation). 85% of the B2B companies and 60% of the B2C companies were “frustrated” because, while they were “doing a lot of digital,” they either didn’t have a cohesive strategy or digital was a separate effort and, ironically, often competitive with what other functional areas were working on. They were siloed by channel and by function, and in the midst of “reorganization.” The idea of an integrated roll-up strategy was “evolving” (this was surprisingly common last year). They never developed an integrated approach – and don’t even really know what it would look like. They had a combination of both the first and second reasons. My experience aligns somewhat with research on this topic. One recent study by Smart Insights found that only 34% of marketers felt their organization had a clearly articulated integrated digital marketing strategy. 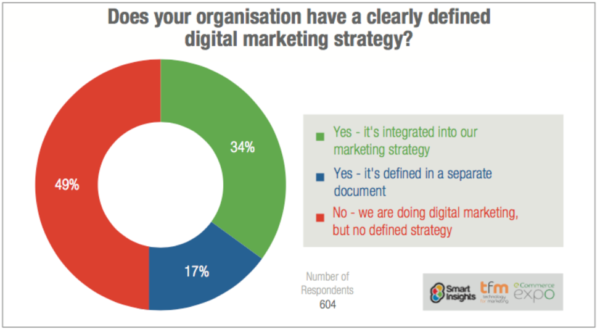 Almost half of the respondents said they were “doing digital marketing” without a defined strategy. Another study (albeit a few years old) from Marketo found that more than a third of marketers don’t have a documented marketing plan. What I find fascinating about all of this is that it may well explain why we see so much frustration in businesses finding their content marketing groove. If, as we believe, successful content marketing is best served as a multiplier to an integrated marketing strategy, it stands to reason that having an understanding of that marketing strategy would be an important component. One of the underlying causes of frustration about the efficacy of content marketing as a strategy may be that content marketers don’t understand the business’ overall strategy of digital marketing very well. This is an opportunity to lead. One interesting opportunity I’ve seen of late is how a foundational content marketing strategy can act as a catalyst for the broader, integrated digital marketing effort. More and more, as marketing teams are reorienting themselves toward a digital transformation, we see the need for content to serve as the fuel. In B2B, the entire lead generation strategy centers on customized content interactions that build trust over a long and complex buying journey. Paid digital media is driven by the need to stand out, and promotes differentiating thought leadership more and the buy-now call to action less. B2B marketing is becoming hyper-focused on targeting messaging into specific accounts. The PR, influencer, and analyst relations teams are laser-focused on developing earned coverage of differentiating viewpoints across myriad digital channels. In B2C, today’s digital marketing is about the content-driven customer experience – and how to develop content that earns the ability to be organically shared. We look to how paid media, native opportunities, and branded content can help the business get beyond the fraud, the bots, and the blockers. We look to social strategies, and how programmatic, search, and influencers can return the big data to make our marketing more efficient. In short, today’s integrated marketing strategy starts with a great content strategy. If we can get to a foundational and strategic content marketing approach – we may just find the heart of a central and integrated digital marketing strategy. I’ve been working with a division of a 50-year-old global technology company in the midst of transforming from a largely event- and sales-driven (i.e., telesales) strategy into a digital content and marketing-driven strategy. It is beginning to assemble its first integrated digital marketing strategy for the division. Yes, really. The primary challenge is that, historically, all marketing campaigns (including the digital bits) have been managed by product marketing teams. They create brochures, PowerPoint decks, and case studies for salespeople, generally in anticipation of participation at an industry-related trade show. The events happen; badges are scanned; lunches are had; and telesales takes over, calling on these leads. New event? New product launch? Rinse and repeat. These are one-off, siloed campaigns. And, in some cases, it even has different products competing for the same audience at the same event. The idea of a division-wide, holistic, and integrated paid strategy is alien to them. There’s never even been an integrated approach that drives visitors to a content platform, nurtures them through an engagement journey, and then aligns and integrates into the PR, event, sales, and funnel process. And this doesn’t even get to the idea of rolling all these product campaigns into a broader, integrated strategy that includes multiple products, solutions, or services. The initial thinking was to let the product managers devise the first and second quarter 2018 campaigns, and combine them to find the synergies to integrate. But, after talking it through, the company came up with a different idea for how to develop the plan. It decided that the integrated marketing strategy should start with a goal-driven and story-first approach. The team assigned the overall business goals of the division to outcomes reached through different content platforms. For example, the existing website will become the trust-development and lead-nurturing engine. It will collect the high-level leads from direct marketing campaigns, events, and the thought-leadership platform (its digital magazine) and will be enriched with data from the campaigns they came from. All the campaigns will be tagged (for attribution purposes), but – based on the content consumed – the nurturing programs and sales teams may be based on the different products and services. This strategy will enable the product teams to “draft” off one another – while still maintaining revenue and lead-generation attribution. No more siloed landing pages, microsites, and leads pooled in Excel spreadsheets. Secondly, the thought-leadership program (the digital magazine) will be a source for the company’s story, which will play through to the newly designed website. The digital magazine will be the center of gravity and focus on building subscribed audiences. Some of these audiences will come from the events the company attended, some will come from paid campaigns, and some will, of course, come organically through search or referrals. It will increase the revenue value of pipeline. It will increase the velocity of the existing pipeline. It will increase the value of existing customers. Based on the four purposes, integrated and standardized “plays” will be developed that define where the calls to action lead, how measurement is applied, and how content is used. There is much more, of course. I’m just skimming the surface, but I’m hoping you get the idea. The interesting thing is how quickly this foundation on content and story-first came together for the global tech company. Instead of starting with how the business can be more clever in selling the features and benefits of products, the product marketers are starting by selling an integrated and differentiated point of view – to which their products are the natural answer. Of course, execution is everything, and we’ll see how all this plays out over 2018. However, what I’m excited about is that the company is seeing the benefit in how clear the marketing planning process can be when the content marketing strategy is the foundation. Maybe, just maybe, we’ve found another valuable role for content marketing to play. Perhaps it’s not just how we can tack on content programs to our sales efforts. A new opportunity may lie in starting with content and allowing the sales materials to be the supplement to selling our differentiated story. 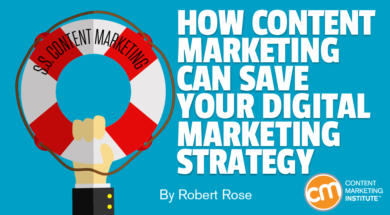 Hear more of what Robert Rose has to say about the future of content strategy and how it can help your own efforts. Register for the Intelligent Content Conference March 20-22 in Las Vegas.